In this September we shipped one motorcycle fuel tank to our customer in Singapore by courier. At the first time, we had tried to ship it by EMS who provide courier service. We acknowledge that they can not handle engine, kerosene heater etc. which may include fuel (even new). Fuel tank of above photo is from Yahoo auction of 2nd hand, without cap, completely dry, no fuel remained, which is just a empty steel can! However, this can not be handled by EMS. They can detect it it by x-ray inspection at customs. 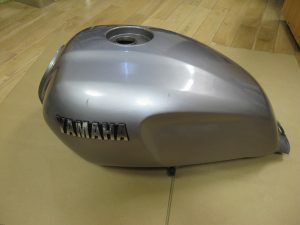 We vv.Japan found other way to ship fuel tank to overseas by courier with our safe guarantee. This way enables to increase our customer’s convenience to purchase 2nd hand motorcycle items from Japan. There are many hard-to-find fuel tanks in Yahoo! JAPAN Auction etc. If you have problem for shipment of fuel tank, please contact us. We can ship your favorite fuel tank to your place. This entry was posted in Proxy Shopping by master. Bookmark the permalink.